Just eight more days until Halloween, are you ready? I thought I would devote this week's Dose of Delight to all things BOO-tiful and fangtastic from the crypts of Instagram. These days, I actually find myself turning more and more to IG than Pinterest when looking for ideas and inspiration. So much creativity, it actually makes my head spin Linda Blair style! Here is a round-up of just a small dose of spooktacular Halloween ideas that I've come across. I know you guys are going to love these ladies and their feeds! My jaw dropped the first time I laid eyes on Katie Nisbett's dining room and I still don't think its returned to its natural position yet! How fabulous is her Halloween decor? The fluttering bats, the floating candlestick; it's all cat's meow! More fluttering bats! Isn't there something so spooky glam about them? I've noticed they're a huge trend in Halloween decor this year. We even added some to the camp-themed playroom but they don't look nearly as nice as Kelly's living room! Looks like they need to do a little dusting before guests arrive, but these two are just DYING to have you over for dinner! How fun is this set-up from The Hudson Home? I mean Dianne obviously won "Coolest Mom on the Block" this year! You know how Apple junkies can't wait for the next new phone to be released, that's how I feel about Stefanie of Brooklyn Limestone's exterior Halloween decor every year. 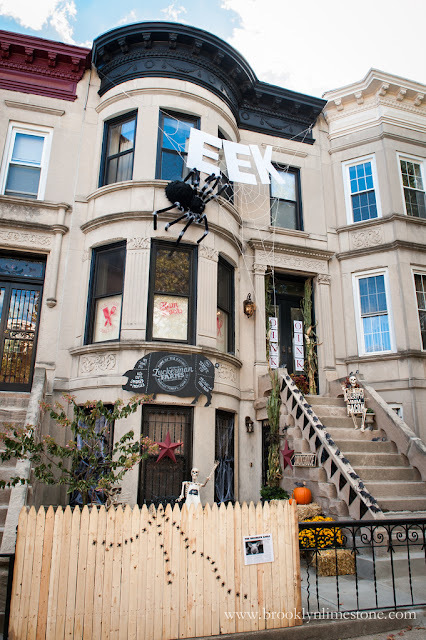 Seriously, you guys she goes BIG and I guarantee her home is a must-see for Brooklynites every Halloween! This year's theme was Charlotte's web with a dark side (ooh, sounds seedy! ); so, so creative! You can find her on Instagram here. I'm head over heels in love with this simple holiday vignette from Twelve on Main. Reminds me a little of our entry way decor with the TERRORific touch of vintage antaomy decor. You can see more of her feed here. How fun were these? Which ones were your favorite? I swear I could have been here for days sharing all of the lovely feeds and bone chilling ideas I've come across but it's time to for this crypt keeper to close the doors! Muhahahaha! You can find little ol' me on Instagram too. Let's hang out!